The farm buildings consist of an 8-stall barn, 80 x 180 indoor riding arena and several run-in sheds located among 9 paddocks. Located on 10 acres on top of a small mountain in Alexandria Township, the farm provides a peaceful spot for you and your horse to enjoy many wonderful hours together. Trail riding is available on the property and nearby. Cross country jumps are located around the property. The farm is located close to the Alexandria Park, Bucks County Horse Park and the Schick Preserve areas for trail riding and training. Laundry is available on site for wraps, saddle pads, towels, etc. 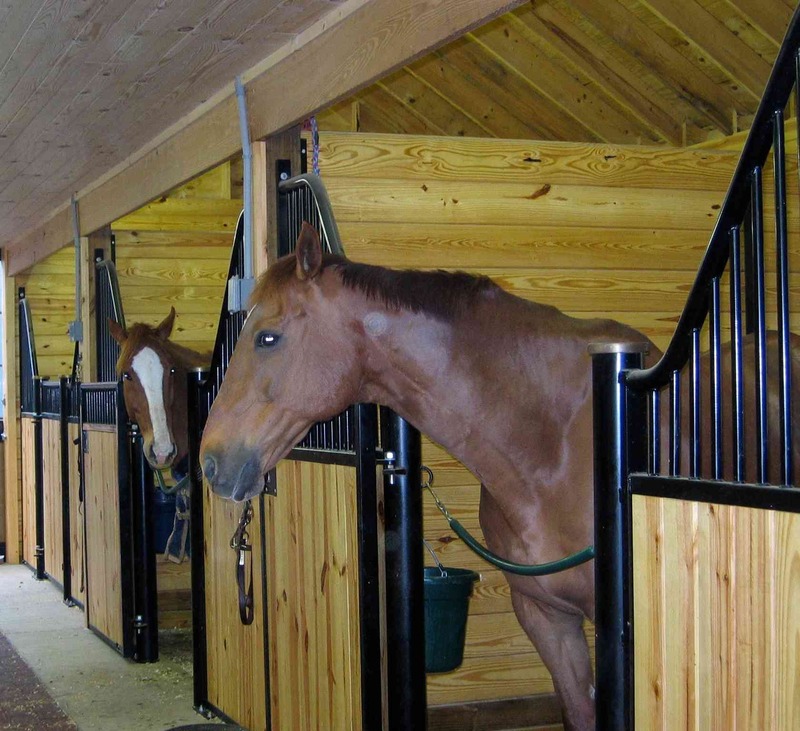 Our eight stall barn has oversized 12 by 14 stalls with hinged doors for the safety of the horse. Each stall is rubber matted, over stone dust, and every horse has a dutch door with a window to the outside. Four stalls have windows in addition to the dutch door windows. The aisle is rubber matted to ease the ache of standing on concrete (for both horses and humans!) and to cushion any slips or falls in the aisleway. The barn is brightly lit with lights in every stall as well as the length of the aisle. The wash stall is well lit to aide in case of any emergency, or just to help get your horse clean! The indoor wash stall has both hot and cold water and a boom-mounted spray shower to keep the hose out from under your horse's feet. The outdoor wash stall is fenced in, has rubber mats, and cross-ties. A large heated tack room is available to all boarders to keep tack, hats, boots and all the assorted items we accumulate in a neat and tidy order. The feed room is available to boarders to keep supplements, medications and other items for feeding at the barn, instead of hauling them around in your car or cluttering up your tack box. The indoor arena is approximately 80 by 160. The arena is airy and open, with many windows and three large doors. It has an angled rider guard around the entire perimiter with gates at each doorway. The footing is a TravelRight product, TR2, a dust-free mix of premium sand, rubber and fiber. 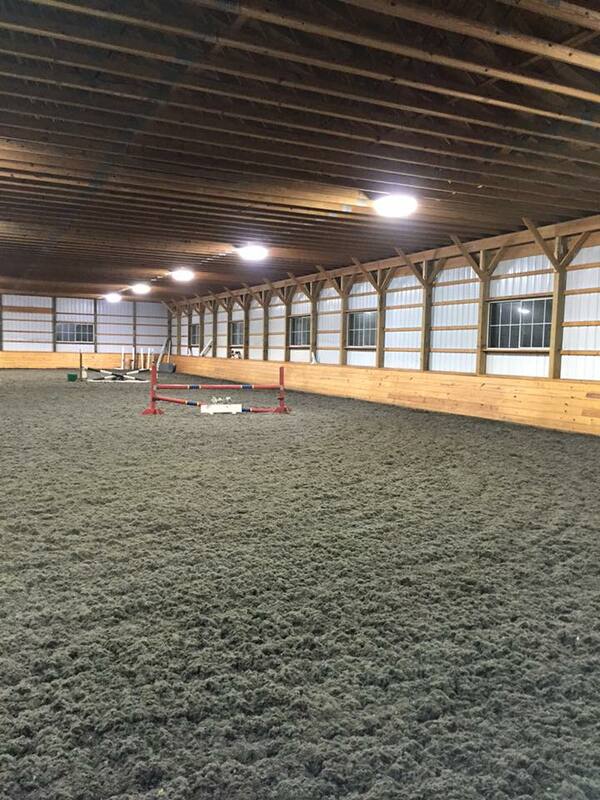 The large size of the arena makes jumping and flatwork a pleasure indoors, summer or winter. Close to the barn, the arena is available and accessible in inclement weather to ride safely and under cover.